The use of switching systems to route instrumentation and stimulus signals to appropriate test points on a unit under test has a very crucial role to play in most electronics test systems. The sharing of test resources, connection of calibration references, load management, and many other functions are all managed by the switching system, the switching system acts as the interface between the unit under test (UUT) and the test equipment. You have a choice in choosing the platform used to control switching. For us the principle platforms are PXI and LXI. This page explains some of the background reasons for these platforms. We have been involved in the development of complete switching systems since our first products were introduced in 1988. Using the knowledge base of reed relays offered by our sister company Pickering Electronics, we were able to develop a range of switching systems based around a proprietary platform that provided GPIB or RS232 control of the relays. Even at that time it was recognized there was a demand for switching systems that were based on open modular standards so we introduced switching products based on both the VXI and the PXI standards. The VXI standard now is not commonly used on new systems (VXI Future) but the PXI standard has proven to be an excellent basis for modular switching products as well as instrumentation. The development costs for the PXI form factor are relatively low once the initial PXI entry barriers have been crossed. The speed of product development can be high, enabling a large variety of standard and custom switching solutions to be made available in response to user demand. More information on PXI can be found in our PXIMate book or from the PXI Systems Alliance web site. Over the years we have become a market leader in PXI switching with over 1000 modules available. The PXI standard is mature and has been widely adopted in the test industry. While it offers a fast communication interface to support applications requiring the exchange of the large blocks of data that may be needed for analysis by the system controller, it also imposes mechanical and power restrictions on the modules. Not all users want their instrumentation or switching products to be extensions of their PC's PCI bus, or for the data analysis to be performed in the PC rather than processing in the instrument. Although it has been hugely successful, PXI has not always displaced the majority of rack or bench instruments historically based largely, but not entirely, on GPIB interfaces. GPIB instruments now have their control interfaces either supplemented or replaced by a LAN/Ethernet connection. The de-facto standard for control via the Ethernet interface is LXI. Ethernet is everywhere on system controllers, and the connection cables are easily managed, have a latching mechanism and have virtually no restrictions on distance or the number of instruments supported. The LXI standard enforces compliant instruments to implement the Ethernet control in a standardized way, eliminating the concerns about implementation conflicts on the Ethernet connection that could arise on proprietary implementations. More information on LXI can be found in our free LXImate book or from the LXI Consortium web site. Standardization of LAN connections for instrumentation was a major leap forward following the introduction of the LXI standard first revision in 2005. The adoption of LXI has been rapid, the value of LXI enabled products shipped is for example much higher than the value of PXI product. Like PXI the LXI standard is mature and stable having reached version 1.5 in 2016, and LXI devices conforming to the first version of the standard still work with the devices conforming to the latest version. PXI and LXI are not competing standards—though in some applications they will have similar characteristics, in others there are clear differences—and that can mean that one platform is more suitable than another. The table below clearly illustrates examples of some of these differences, the relevance of any one factor in this table is rather dependent on what product the user/vendor wants to create. Not constrained by the standard. Defined module size (pitch, height and depth) which has a relatively small footprint Typically based on half or full rack width formats with whatever height an depth is required. Can be modular based either on other standards (including PXI) or proprietary standards. Devices can be added to the network. Bus Interface PCI or PCIe connecting the module onto the controller bus with limited connection distance to the controller. Ethernet with almost unlimited connected distances, including inter-continental distances over VPN's. 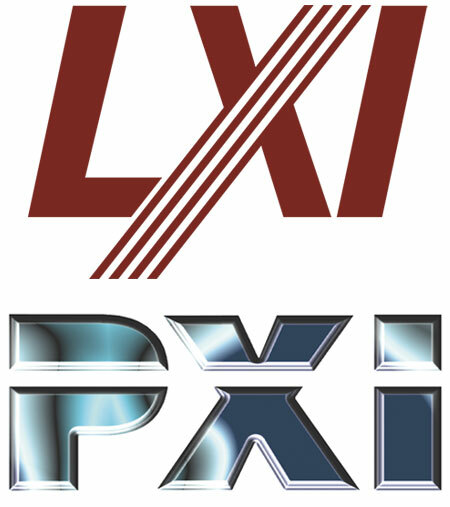 For LXI instruments they are largely platform agnostic, whereas PXI is very dependent on the PC architecture (and in many implementations Windows). LXI Devices do not have many mechanical or electrical constraints, but PXI has to conform to the PXI standard in order to benefit from the multi-vendor chassis platform. They can also have quite different data speeds as well. Although PXI has the faster connection speeds it relies on processing data in the controlling PC—so it inherently needs a high speed interconnect to perform data processing functions. An LXI system might be expected to process data within the LXI Devices and simply has to report the results, but can also dump blocks of data for controller processing. It is a fundamental objective of the PXI standard that it has to permit products from different vendors to co-exist in a chassis, otherwise as a standard it fails to meet the market expectation and the objectives stated in the standard. That means that a chassis, and indeed the software infrastructure, has to operate with potentially many different types of modules (instrumentation or switching) in the same chassis. The chassis design has to meet the expectation of all PXI vendors and that requires the defined minimum requirements set out in the PXI standard. The PXI chassis choice can get a little more complex since the PXI standard has evolved into two distinct types of backplane control interfaces, PCI and PCIe, which are not interchangeable. PXI chassis provide slots which support PCI based modules, PXIe chassis can provide slots which are either exclusively for modules that are PCIe based, support both PCIe and PCI based modules (but not at the same time) and PCI based only slots. The increased complexity of PXIe chassis means they are more expensive to manufacture when they support both PCIe and PCI interfaces. Therefore you need to take care on choosing their chassis to ensure that all slots can be used, but otherwise inter-changeability is largely assured by compliance to the standard. Care should be taken to ensure that the modules you require are available in the interface available on the chassis backplane, the vast majority have PCI interfaces rather than PCIe interferences. For LXI since there are no chassis constraints to concern you, simply complying with the minimum set of requirements set out in the standard is enough unless specific support is required for the optional extended features, such as IEEE1588 timing. For switching, speed differences are of little consequence, because in practice, the speed of change of switching systems is constrained by mechanical components (relays)—even solid state switching does not need the multi gigabit speeds of PXIe. The mechanical and electrical constraints of PXI can influence what can be cost effectively supported in PXI, but on the other hand the overheads of a LXI device can limit the minimum functionality that can be cost-effectively supported. As ever, one standard does not fit all. LXI offers the greatest freedom of design while PXI offers a means to integrate small modules into an open standard chassis. Not surprisingly, that means both have their place and both standards can claim circumstances under which they might perform better than the other for switching and other applications. In our case, we have a very large range of PXI switching products that have been developed over the years. A significant number of users have found that PXI is the natural answer to their switching needs, and indeed it forms the majority of our switching business. These users are typically using a mnot as a single matrix.ixof instrumentation and diverse switching functions, often through the use multiple vendors to supply the solution. There is a clear distinction based on size. Where, for example, a large structured matrix is required then, LXI will often be the better choice. We offer a range of large LXI switching matrices aimed at this type of application. PXI can be used to implement these large systems, but the PXI chassis cost, cable interconnect cost and software complication of implementing a large switching function over many modules increases the system cost, decreases its performance and adds complexity to the system control and programming time. A matrix created from multiple PXI modules that are cable connected is controlled as separate modules, not as a single matrix. with connecting cables with the user having to control each sub matrix independently. In PXI, some of these issues can be partly addressed by using modules that extend over more than one slot, an example being our BRIC PXI matrix. These products integrate the switching system over 2, 4 or 8 PXI slots using only one connection to the backplane and then use their own backplane to provide connectivity between the sub-assemblies in the BRIC. That reduces cabling and interfacing costs that would otherwise by incurred and make a PXI solution much more competitive, though still nothing like as competitive as can be created in in LXI platforms with even larger switching systems. More information on BRIC designs can be found here and general topics about BRIC's here. Our PXI modules do not have to be confined to PXI chassis. For those of you with diverse switching needs, PXI designs may suit your application but you do not necessarily want to spread your computer PCI bus to external modules. For example, you may need to have a longer distance between the controller and the switching system chassis, or maybe want to get a more web like feel to the system for remote access, or have the ability to make changes without powering down the system controller. 40-923A PXI modular and 60-103B LXI modular chassis. Both of these chassis host PXI modules, the PXI chassis (left) shows a remote control interface fitted for connection to the PC1 bus in the left slots, the LXI chassis (right) shows our proprietary LXI controller fitted which provides control of the chassis and the modules its hosts. For these applications we have introduced our LXI chassis that support our PXI modules, the restriction to our modules is a software issue rather than a hardware issue. The LXI chassis has an embedded Linux based controller that requires access to source code for the modules supported. The same controller gives the user a barrier between the PXI modules and the system controller that gives it all the features of Ethernet connectivity, including web-based management of the PXI switching modules. Modularity is not disallowed by the LXI standard, it is simply not a requirement of the standard. So vendors can also create proprietary modular formats to solve particular problems. We offer a couple different options that are examples of this. Our 65-110 wideband modular LXI chassis solves a user requirement for a very broadband (usable to 500MHz) matrix with excellent crosstalk ( see our application story, 65-110 for CERN). The chassis provides a proprietary cable-less interconnect between modules with each plugin module having a much greater footprint than PXI. The other is a 65-200 modular LXI chassis, it offers you a solution that can be easily re-configured by the insertion and removal of up to six LXI matrix plug-in modules. We will soon offer a solution that includes this chassis with some high-density Reed Relay plug-in matrix modules that provide access to all signal connections on 200 pin connectors. It is capable of supporting matrices with a Y-axis size of 4 and expandable in the X-axis range up to 1,536 in increments of 128. Another important feature is that over 1,500 relays can be closed simultaneously for specific conditions for parametric testing. There really is no "best" platform for signal switching in automated test systems; the LXI and PXI standards bring different advantages and disadvantages depending on what you may be trying to do. In this respect, instruments are also not that much different—there are always examples of where PXI and LXI implementations will have different compromises on cost, performance and size. Vendor designed enclosures will usually convey performance advantages to LXI solutions; a modular chassis system can offer advantages in cost and size for diverse systems particularly where the functions required are diverse and high levels of multi-vendor integration are required. So there is a wide spectrum of possibilities open to you. For companies like us who embrace both the LXI and PXI standards for our core products, it is very much a question of letting you, the user, decide the most appropriate solution for your application rather than forcing you to use a particular platform. That is the nature of standards; they use a set of assumptions when they are created that have consequences when products are created that use them. For our company, those consequences to switching systems create different ways of tackling problems that depend on component size, switch system size and switching system diversity. That is why we embrace both the LXI and PXI standards.